Birth of the E30 Coupe Owner's Journal! 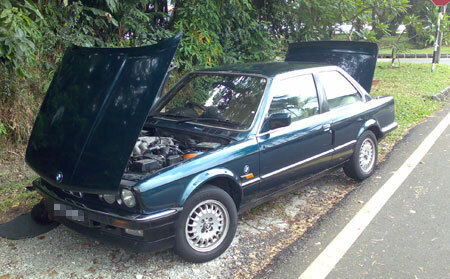 Home » Cars » BMW » Birth of the E30 Coupe Owner’s Journal! Birth of the E30 Coupe Owner’s Journal! 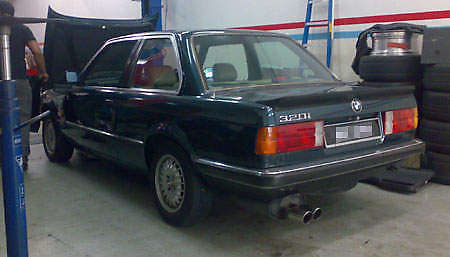 I’ve been tinkering with a new toy over the past two day in the company stables – an E30 3-Series Coupe. If you’ve been a long time follower of this site you may remember a post back in end-2005 where in a caffeine-induced moment I went rambling about how I thought the E30’s design was timeless and how I wanted one. Well, nearly four years later I finally got one, by accident really. A friend had placed a deposit on this automatic Agate Green 320i Coupe with a 325i engine but later found a manual 323i Coupe with a sunroof. He wanted a manual to begin with so he was looking for someone to take over the 320i, and after having a look at the car I was sold. 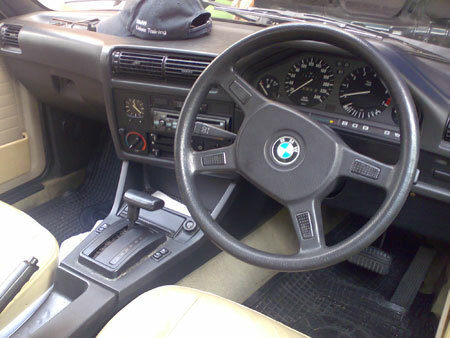 What really attracted me was the fact that this particular E30 Coupe had an interior in really good condition. Cream interior with leather seats, no cracks on the dashboard, leather seats in great condition, and everything worked, from the electrically adjustable power windows, the dashboard clock, all instrument gauges, etc. No white smoke (or black for the matter) from the engine, though there was a hairline crack in the exhaust header, but that’s a minor issue. The car had a little timing issue where whenever you shifted gears into D or R from N, the RPM would drop a little and sometimes the car would just die off. This was fixed by raising the engine idle speed a little. That stopped the engine from dying but there was one problem – when you shifted into gear, the oil pressure light would come on awhile and would go away once you revved the engine a little. Well, that was that… or so I thought. And then the adventure began. We (road tester Harvinder and I) were on the way to the mechanic’s place to get some electric fan issue sorted, the oil pressure light came on permanently. This was somewhere in TTDI. Panic ensued – an oil pressure issue is not one to be taken lightly. 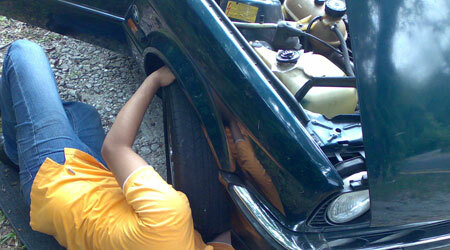 An engine needs oil for lubrication to function properly. Friction is your engine’s enemy. Of course it could mean that the engine oil pressure has dropped to a very dangerous level which could mean the engine’s oil pump has failed, or the oil pressure sensor has failed. We remembered checking the engine’s oil level just yesterday so it couldn’t really be possible for the engine to have no oil. So within a few minutes we navigated through the TTDI jam into one of the housing area and parked the car. We turned off the engine as soon as we could to prevent or at least minimize any possibility of damage. For some reason our first reaction was to check whether the oil pump worked or not. This is an easy test, at least on this particular M20B25 engine. Start the engine and open the oil filler cap. 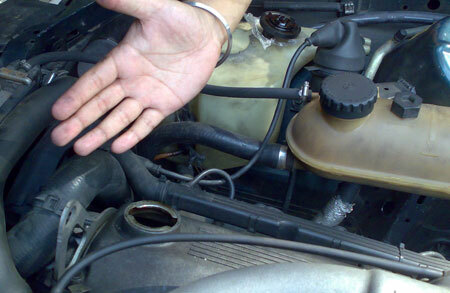 Put your palm above the oil cap. You should feel little drops of oil on your palm. These are the splashes of oil from the cylinder head oil squirters. We didn’t get any drops – a bad sign! 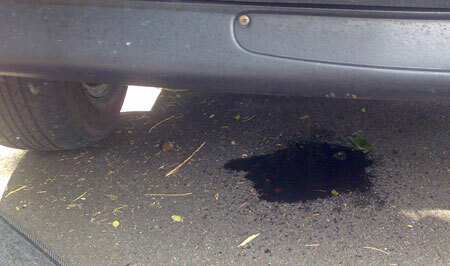 And then we noticed something that wasn’t there when we first parked the car – a small puddle of oil had accumulated under the engine! The engine was leaking oil! No wonder there was no oil pressure – there was no oil in the engine! Sheesh – but this didn’t really eliminate the possibility that either the oil pump or the oil pressure sensor might be gone too. We jacked up the car and had a look underneath. Oil seemed to be leaking from something that looked like the oil pressure sensor – so it seemed likely that the oil pressure sensor is damaged and engine oil had been leaking from it. After a quick walk across the busy TTDI road (it’s insanely hard to cross that road on foot) to the BHPetrol station and back with a 4 litre bottle of mineral oil, we filled the engine up and started it up. We did the palm test again and I think you can see the results above – oh glorious engine oil! The oil pump was working. Now all we had to do was to quickly get to the workshop before the engine oil leaked all out again. We did, thankfully. It was confirmed that the oil pressure sensor had failed and to make it worse engine oil was leaking out of the engine through it. Replacing it with a second hand unit fixed the problem. We did another engine oil change at the workshop. The E30 has since been running reliably so far. The BMWs of that age were really built to last. Only a few bushes and suspension parts need to be inspected and changed, and that exhaust manifold crack has to be fixed, then it will be perfect and perfectly suitable to be used as a daily runabout car! It’s going to be used as a run-about for the company whenever it is needed. Anyway I intend to start a journal to chronicle the experience of a second hand E30 buyer on this blog under a category so that it can serve as a guide for anyone who is adventurous enough to want to go down the same route and drive an old reliable and fun BMW instead of a cheap brand new car. Stay tuned for another update later :) In the meanwhile, are there any other E30 owners here?